So I love colors of India and my love has only grown and as time passes I continue to drench myself in the colors of India from the Rang Rangeelo Rajasthan to psychedelic sunsets in Kerala and everywhere in between. 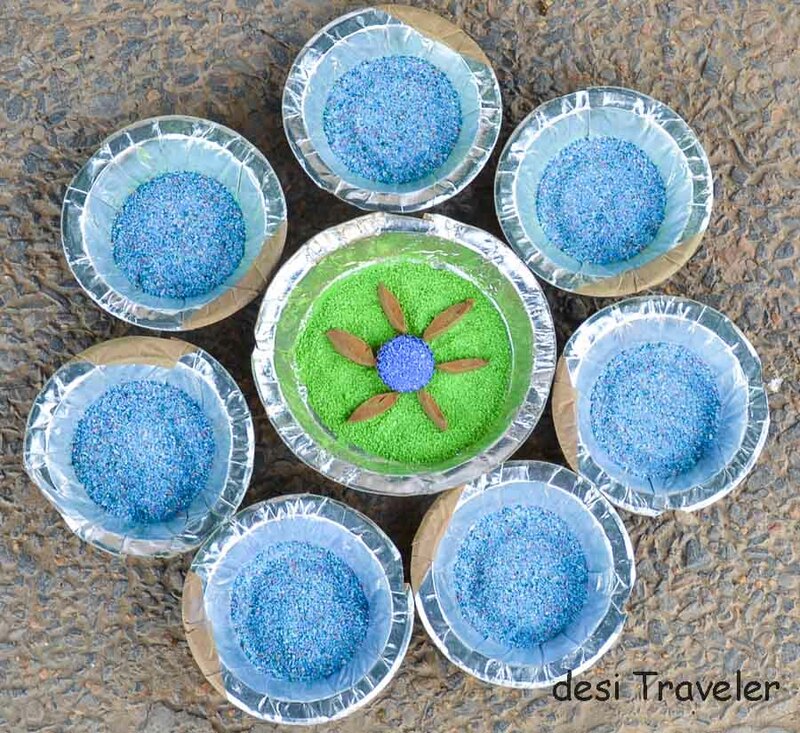 We Indians express our joy with colors, Red, green, blue, yellow, white blue every color has a significance a reason and a place in the Rangolis we make in front of our homes. 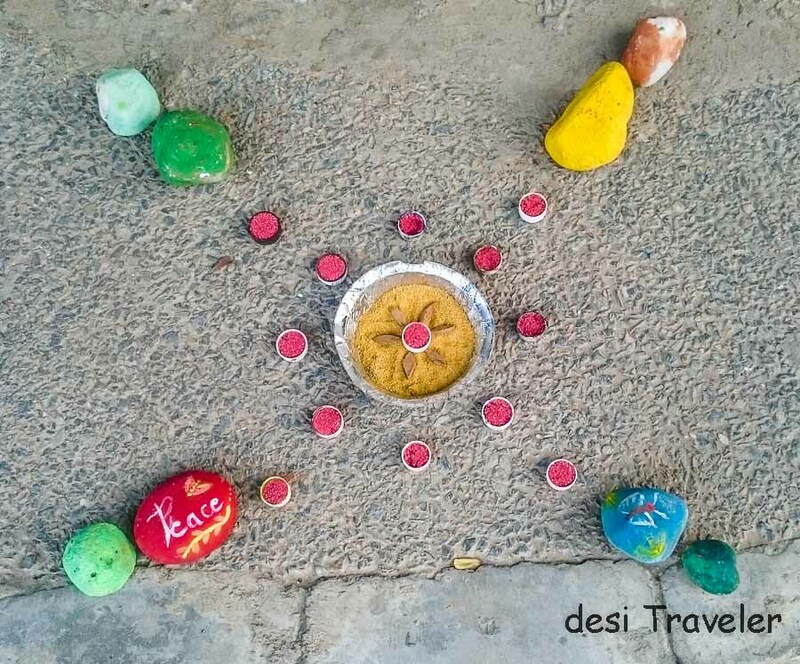 Yes this post is about Rangoli but very different kind of rangolis that I had never seen before. 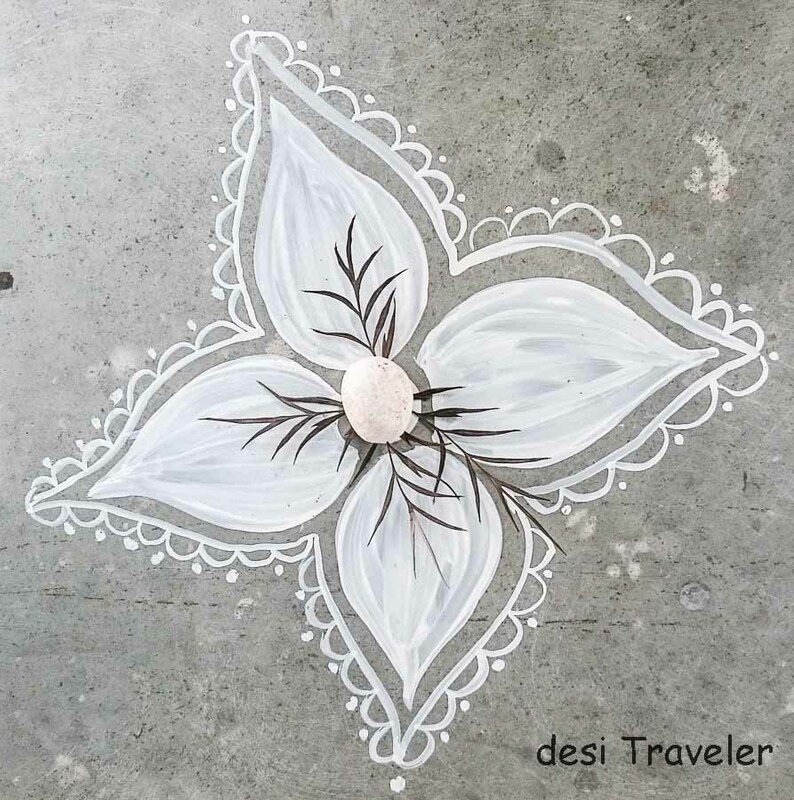 May I call them modern Rangoli designs that take the traditional design elements and motifs like leaves, flowers, circles and colors and blend them with modern themes and presentations? 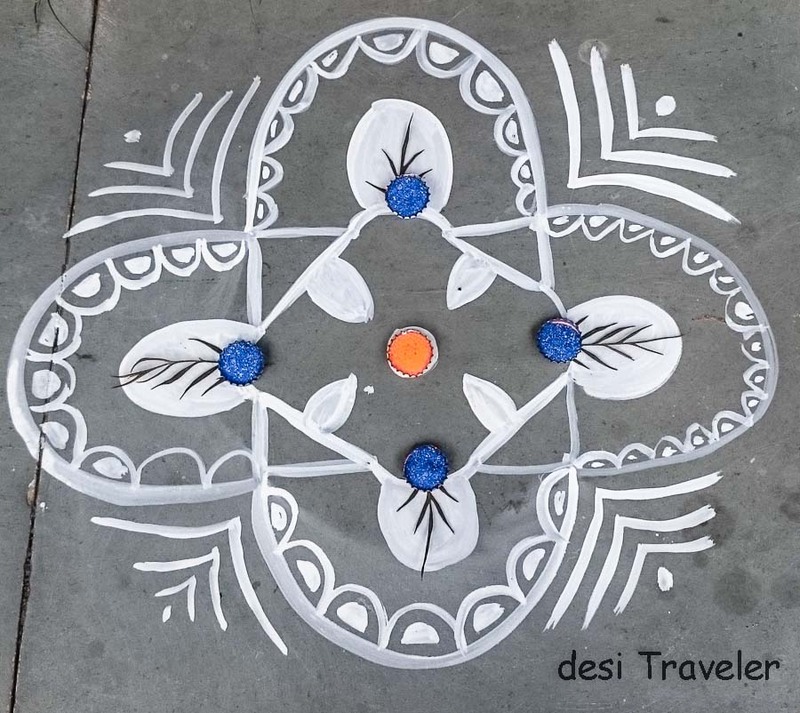 Before we move further may I suggest you go through these earlier posts about Rangoli designs (रंगोली ) to understand better where I am coming from? 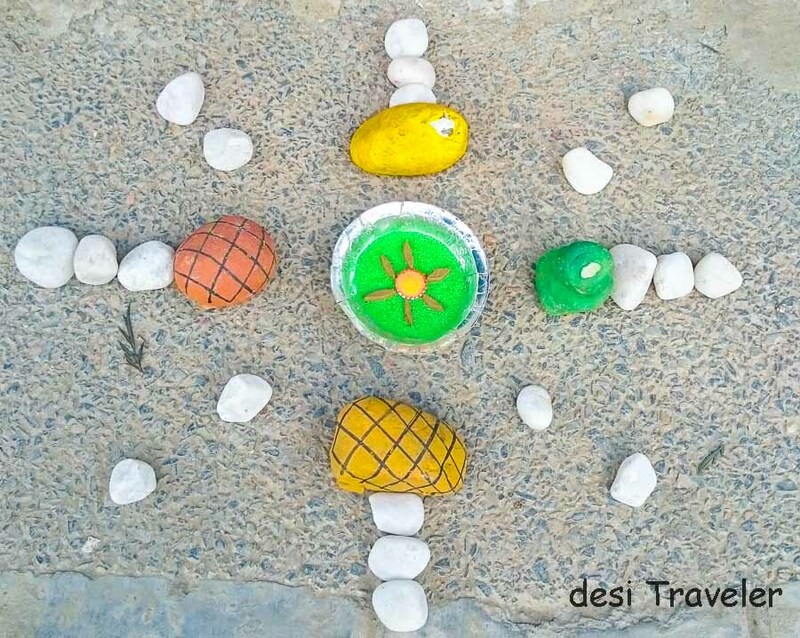 While the first post is about the traditional Rangoli that village women make in front of their homes on festivals like Sankranti, Dusshehra, Diwali etc. 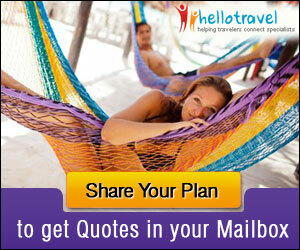 the second one is a more formal flora designs following geometric patterns used in hotels and cities to welcome guests. While the first one is totally free form and depends on the creativity of the lady of the house, the second one though still made by women but serve a purpose of welcoming guests and follow a more structured approach. The third one using Vapru is more popular in Kerala and normally used in combination with a lamp to welcome guests and exclusively uses flowers and leaves in a shallow vessel at the entry of homes and hotels and shops. 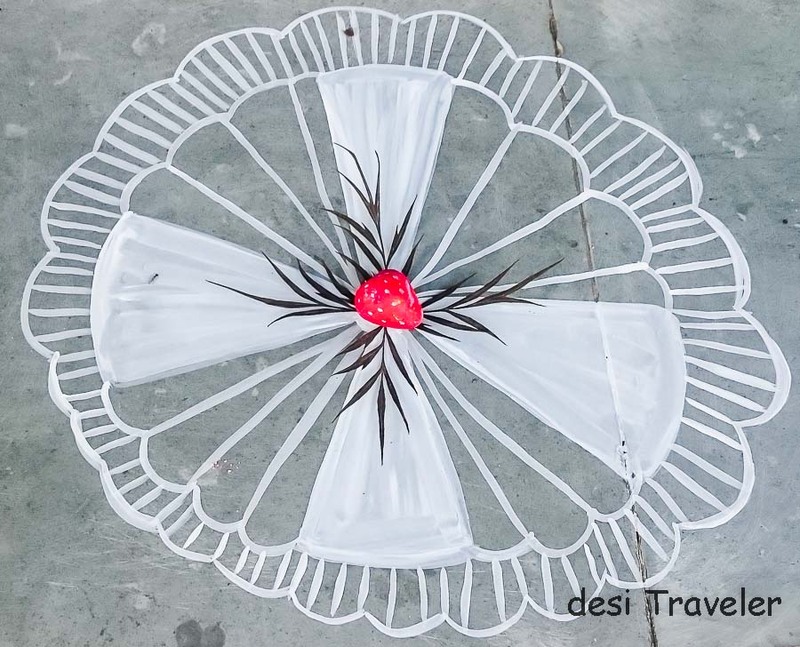 As most of you will know the traditional Rangoli is a decoration that most rural houses in states like Telangana, Andhra Pradesh, Tamil Nadu, West Bengal, Odisha , Rajasthan, Manipur etc . 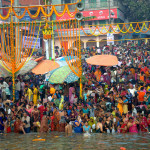 While in cities the tradition followed mostly on festivals it is the rural India that follows the same regularly with festivals bringing out the best of creative designs. Every state has its own design patters, colors etc. the basic principle remains same it is a kind of welcome sign to welcome guest, good energy and showcase how skilled the lady of the house is. 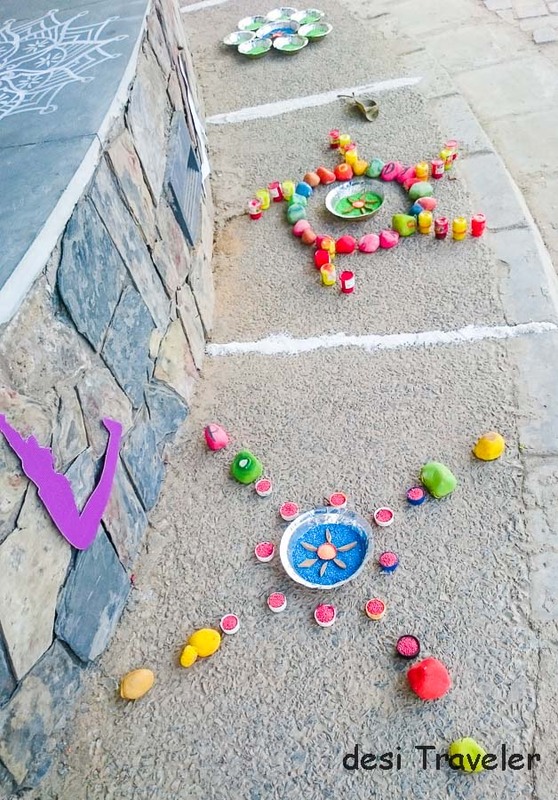 The rangoli is her first sign of personal touch to her home; daughters learn the designs from their mothers and grandmothers and carry it to their in-laws home. 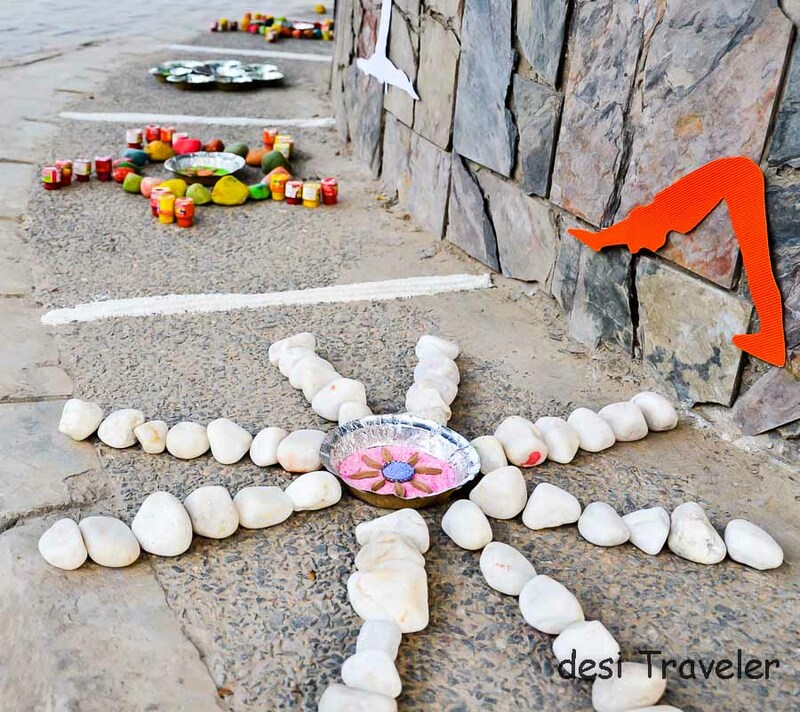 In one of the companies I worked for it was almost like a prestige issue to be part of the Rangoli team of company and get the opportunity to make one for visiting clients and guests. May be one day I will write a post about that but till then let us go back to these modern Rangoli designs that I am so impressed with. But don’t take my word for the same have a look at the same. Surrounding a Banyan tree in the courtyard of MatriKiran School these Rangoli designs are the brainchild of the teachers of the school who have painstakingly thought about the same and executed with help of students and staff. 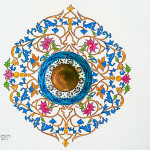 Each design combines elements like sun, floral patterns, peacock feathers, spirals etc. 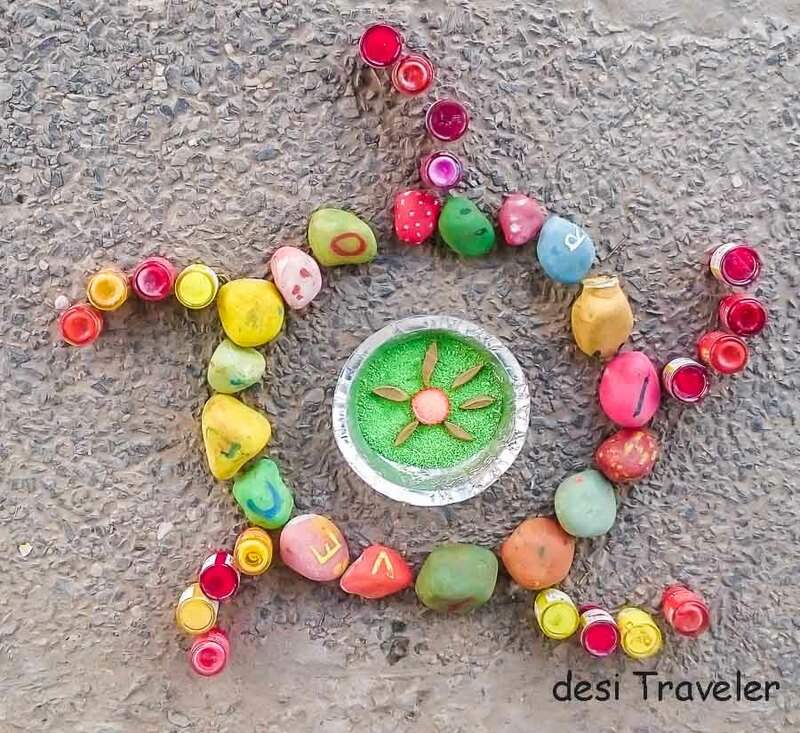 but where the creativity stands out is use of nontraditional objects in the design like pebbles, water-color bottles, discarded CDS, bottle caps and carefully placed message of peace in the stones. 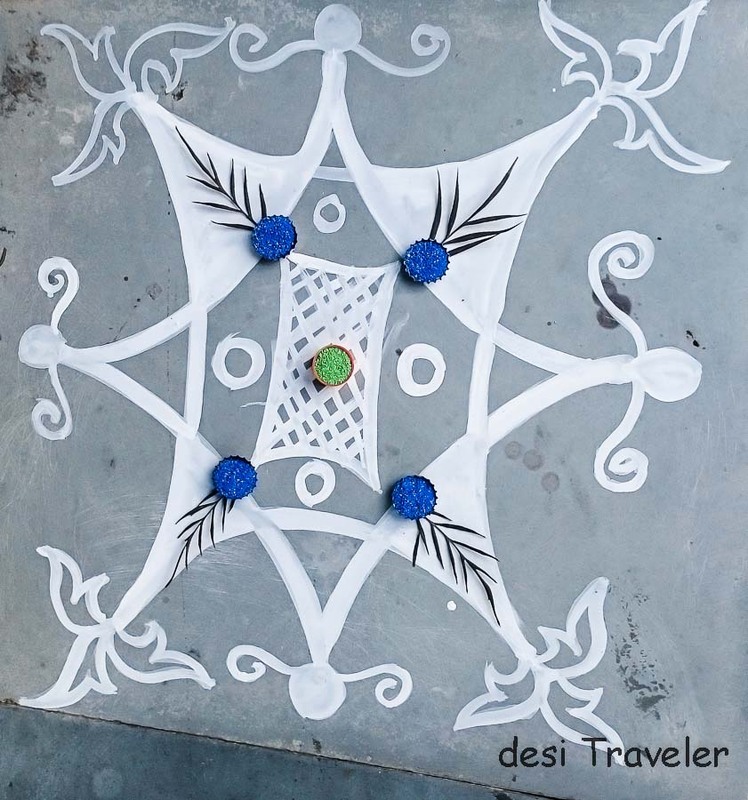 The moment I saw these Rangoli designs I was impressed at the out of box thinking, beauty of the design and the innovative approach to use colors and materials to create traditional designs. 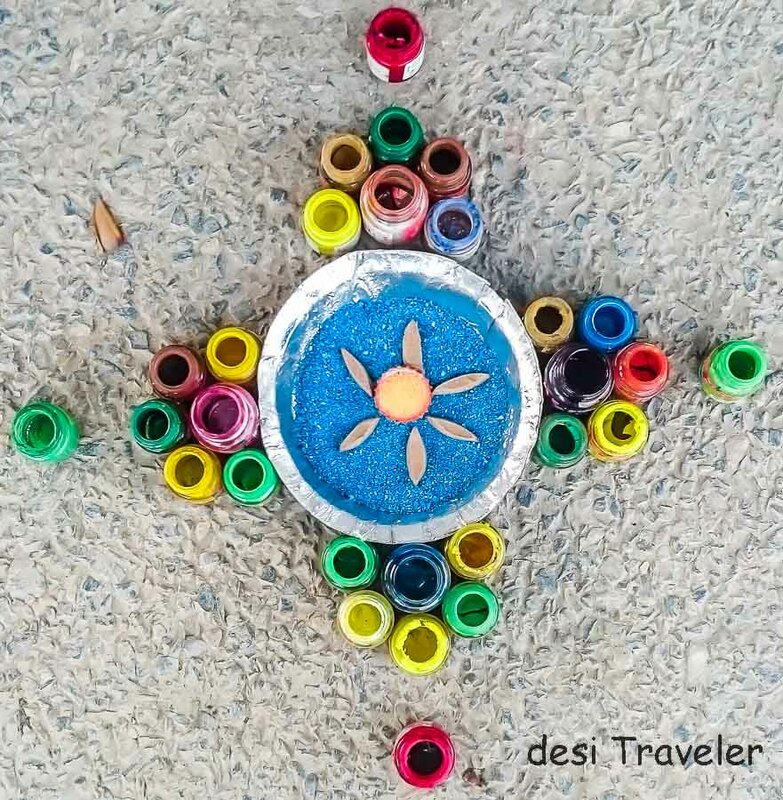 While my favorite is the flower created by using discarded CDs, I am also very impressed with the used watercolor bottles surrounding a floral Sun smiling in a blue sky created in a paper plate used in kid’s birthdays to serve snacks! 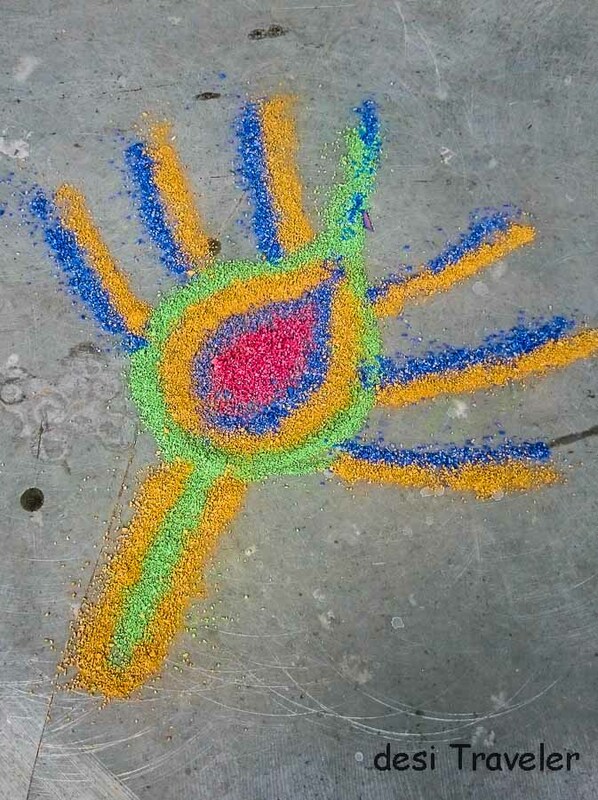 Click on the circles below to see the full Rangoli design. Have you ever seen such a rangoli ? 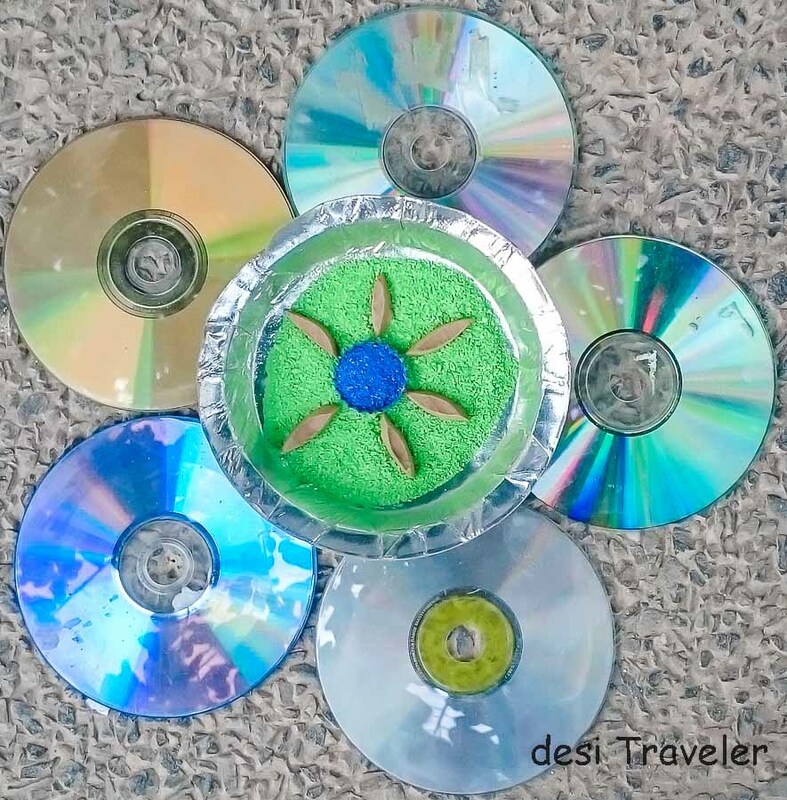 Not only these designs celebrate the colors of India, they also teach kids about our tradition of making Rangoli but also make them think out of box, look around and create beautiful art that connects them to our roots using day to day objects around us. 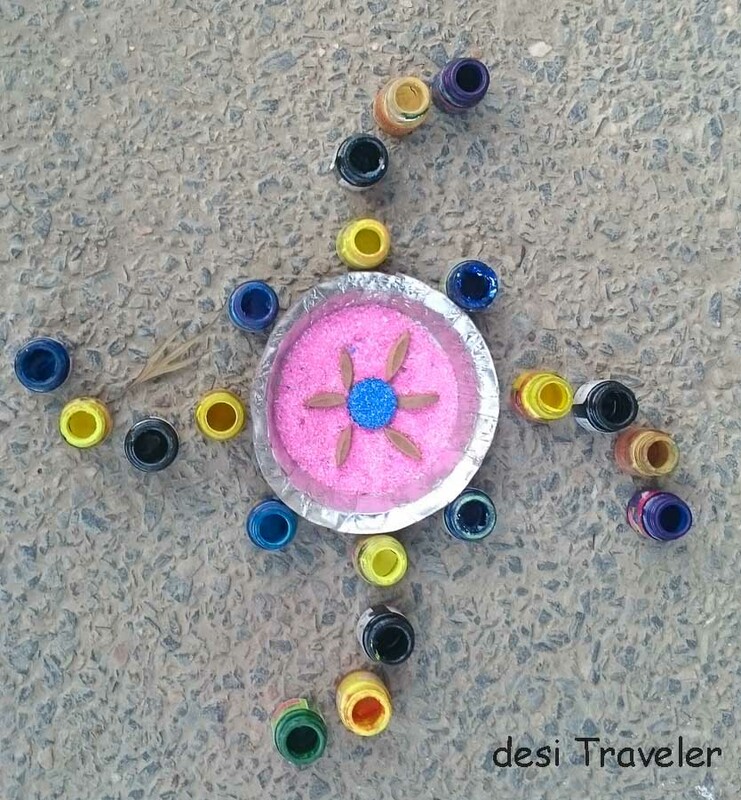 What else do you think is the purpose of art if not make us look at the beauty around us and motivate us to create more art in a simple yet powerful way and if in the process you can involve the kids then I think the purpose of these Rangoli designs was achieved. 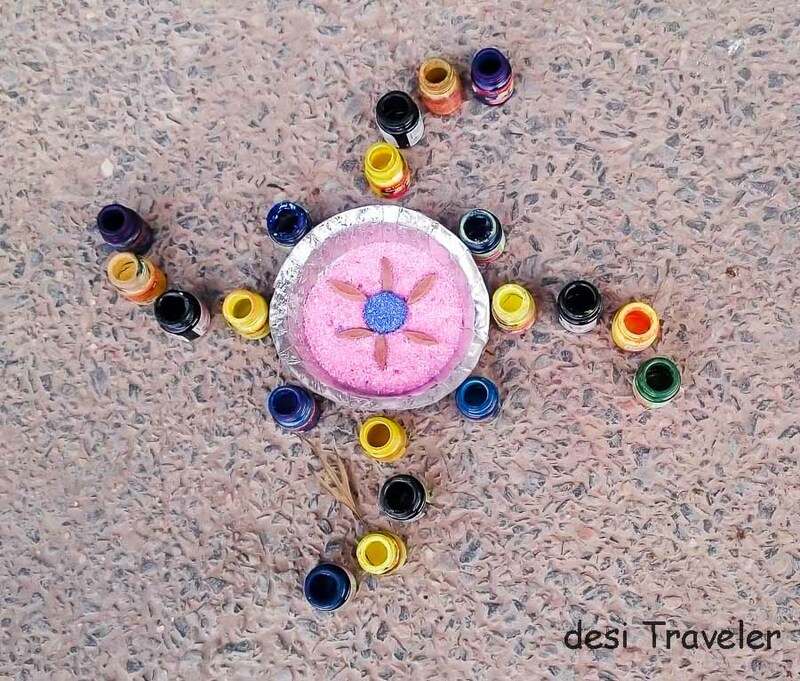 What do you say dear reader about these wonderful Rangoli designs that combine modern innovative materials yet do not betray the traditional design elements, only reinterpret the themes in a very impressive way. How about sharing some pictures that you have clicked here or send them to me via email to thedesitraveler (at the rate ) gmail dot com. 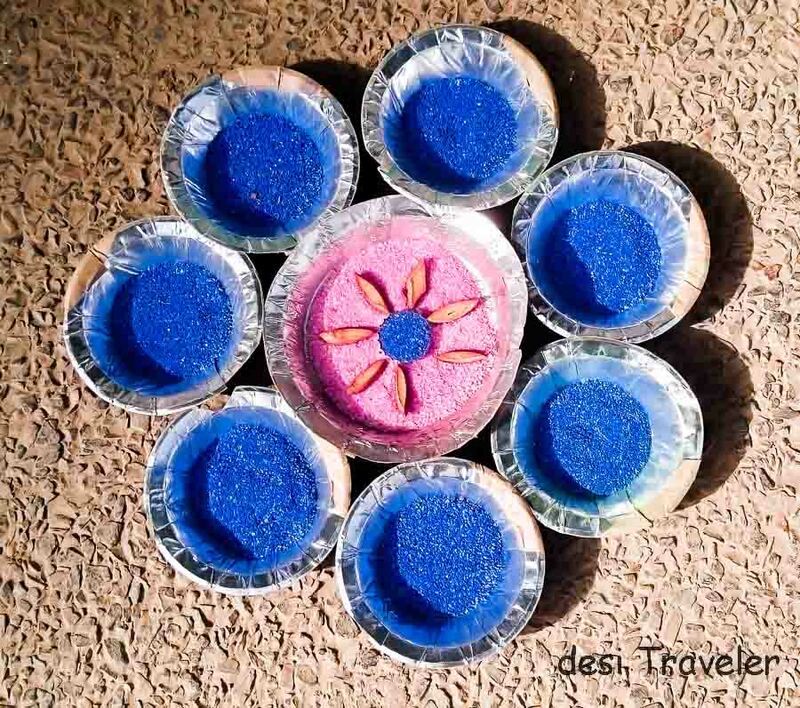 The best Rangoli designs received will be showcased here as well as on Facebook Page of desi Traveler with full credit to the sender. I don’t read post but yes, I watch photos and they are brilliant. 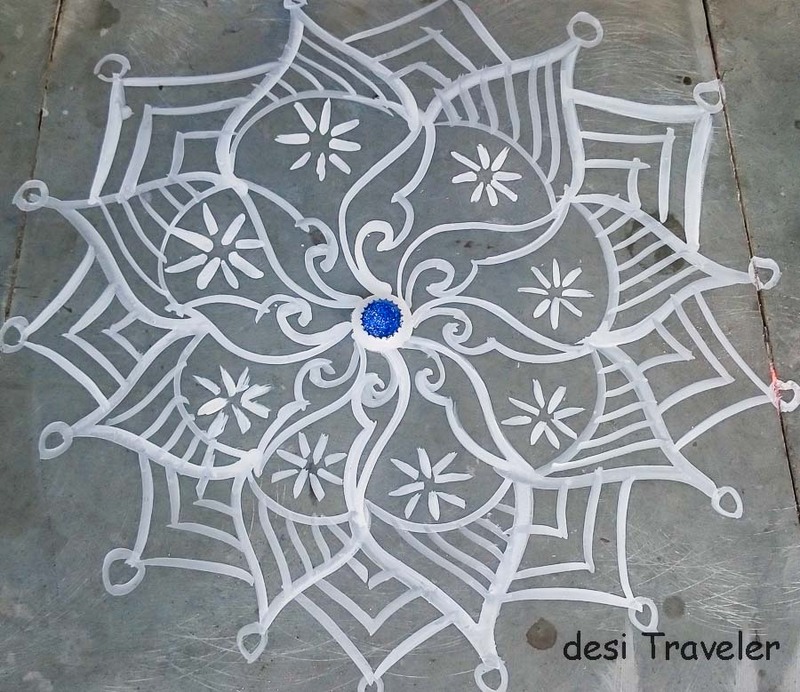 They rewind memories when I visited Vrindavan and saw something similar Rangoli designs. Thanks for sharing photos. 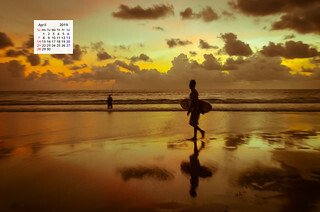 Love these photos – so colourful! I can never do these rangolis as effortlessly as some women do. Here in Bangalore, it is common to see one being freshly made everyday. I only try them on Diwali. Great pictures. 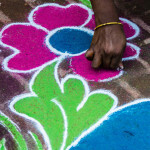 I was most amazed by these women in Pondicherry when they made Rangoli designs so quickly that it was tough to see their hands.